The Headwear Accessory Pack contains three crochet patterns. 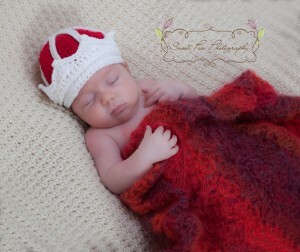 Crown 1 is suitable for baby photographs (prince or princess), dressing up, occasional wear or ‘hen’ parties. You will need: up to 100 m double knitting yarn, a 3.50 mm hook and a needle for neatening ends. A flower embellishment is included, although you may also like to use beads and/or ribbon to decorate your crown. 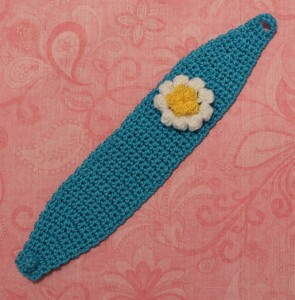 Gauge: 8sts to 5 cm (10”) in UK double crochet. Depth of crown at maximum is 7 cm (2½”). The headband/ear warmer has instructions for 35 (40, 45, 50, 55) cm or 14 (16, 18, 20, 22) inches. Custom sizes are possible and this is explained at the appropriate section of the pattern. Crown 2 is the perfect prop for your little prince. Can be worked in sizes 30-50 cm (12-20”). You will need: up to 100 m double knitting yarn in MC and CC, a 3.50 mm hook and a needle for neatening ends. Beads and trims and a small amount of stuffing are optional. Gauge: 8sts and 4 rows to 5 cm (2”) in UK double crochet. This entry was posted in Crochet, Featured, Photo Props on April 18, 2013 by Thomasina Cummings.